male, born in 1941, is a native of Chengdu, Sichuan province. He is now a member of the Chinese Artists Association, director of its Sichuan branch and an artist of the Sichuan Poetry, Calligraphy, and Painting Institute. He is rated as a national fist-class artist. Harbouring an ardent love for painting early on in his life, he taught himself to be an artist. Peng has visited Thousand Buddha Grottos in Dunhuang and Xinjiang for artistic exploration. He has been to Large and Small Mounts Liang on his own for sketch purpose. He established his unique painting style in early 80’s. He is specialized in “boneless” brushwork and portraits of horseriders. With ancient poetic subject matters and his intuition, he skillfully emphasizes on the contingent relationship of water and ink, integrates the Han and Tang styles into his own works. His works show elegance, austerity and spirituality, exhibiting a combination of the ancient and modern touches mark his style. 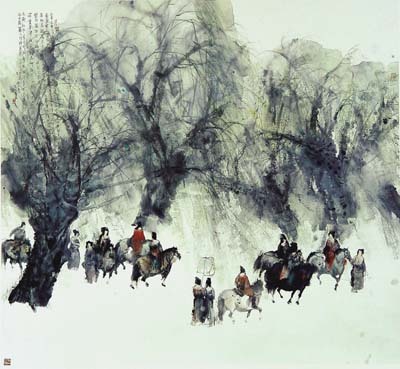 His work “Western Chamber” was awarded a Silver prize in the 7th Chinese National Art Exhibition in 1989, and his work “ Polo” was awarded First prize in the Athletic Art Exhibition. He held a solo exhibition in Hong Kong in 1990 and was invited to the U.S.A for an artistic exchange program under the International Visiting Scholars Project.